Last year, the West Hollywood City Council overwhelmingly approved the Arts Club. Founded by Charles Dickens in 1863, the Arts Club is going to replace the Hustler store with a bistro, music and art gallery, along with free rehearsal space for local singers, dancers and performers. The Arts Club is generously providing more than $13.5 million in community benefits to West Hollywood residents, which includes over $10 million dedicated for free rehearsal space for our local artists and musicians, over $1 million will be provided to arts education and scholarships, and approximately $1.25 million to promote art, artists and performers. The Arts Club will have spectacular architecture. New street trees will be planted; the cul-de-sac on Hilldale Avenue will be modernized and landscaped. There will be sidewalk seating and beautiful public space. Because there was a referendum, the City Council in its wisdom, decided to place the Arts Club on the March 5th ballot to allow the community to weigh in. Please support the Arts Club and preserve the vision and future of the Sunset Strip by voting YES ON MEASURE B! The Arts Club would REPLACE the Hustler store and instead provide a beautiful and iconic addition to the Sunset Strip! The Arts Club is also contributing half a million dollars to affordable housing in West Hollywood. Their generosity and commitment to be a part of our community is truly commendable. The Arts Club honors and respects West Hollywood values. There is no better way for them to demonstrate that than by being a model employer. The Arts Club offers wages equal to and above living wage, they give their employees a full benefits package, and offer child care and telecommuting opportunities for eligible employees. The Arts Club is committed to hire West Hollywood first, and will have amazing job opportunities. It truly is an honor that the Arts Club has chosen West Hollywood as their first United States location. Our unique, creative, and diverse city is the perfect location for the Arts Club, and the Arts Club is the perfect addition to the Sunset Strip. Not only is the architecture and design of the proposed building breathtaking, but their mission to provide artists a space to display and engage the community is admirable. The Arts Club is supported by hundreds of local leaders, residents, and small business owners in West Hollywood. Please join our community and preserve the Sunset Strip. VOTE YES ON MEASURE B! 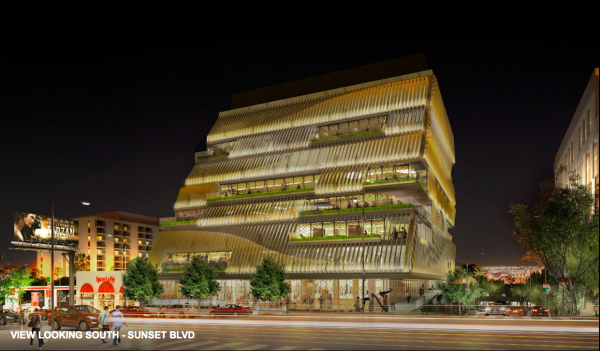 Residents to Preserve the Sunset Strip is a committee organized to fund a campaign in support of the West Hollywood City Council's approval of the Arts Club project on Sunset. John Heilman was 100% correct in his vote against the project endorsing a deviation from the General Plan. The General Plan is not a pretzel. The Unite Here Local 11 protest miraculously dovetailed to illuminate the issue in an odd way. Sometimes the universe gives gifts. Zachary Vella has an interesting roadmap of dealing in Manhattan with too many issues to link to this comment. Spend a few moments doing your own research. Got into a spat with Ben Soleimani a few years back and is also part of the Barney’s Beanery project which has an intersection with Richard Weintraub and his escapades. Weintraub was brilliant demonstrating a slight of hand a few years back, when the city was inquiring about 51% v 49% regarding the Sunset Doheny project that was eventually entitled and then sold to become the Ian Schrager/Marriott Edition. The questions arose during the heat of the Ezri Namvar Ponzi scheme. Roadmaps can be stranger than fiction. Word of the Netflix show followed the news that Goop had to settle a $125,000 lawsuitover false advertisements for a $66 vaginal jade egg, which the company claimed would balance hormones, prevent uterine prolapse and more. The egg has been one of many overpriced and ineffective, or even harmful, products that Goop has sold, according to medical experts. Question is will the building fall when Paltrow’s star falls? The company was appropriately called Goop. Isn’t that something folks scrape off of their shoes? Many folks fall for insipid nonsense. As a resident of WeHo for the last 15 years I welcome this addition to Sunset. I’m not part of some PAC, just a long time resident that welcomes the change. The Hustler building is done and is not a value add at all. I also don’t believe the public should be voting on a building after going through the city and planning commissions -similar to what the other commenter stated. Unite Here Local 11 is trying to dictate what the city can and can’t do as they use it as a negotiating tool to be hired. They tried this on the Robertson Lane project and it’s complete BS. The vast majority of residents that came to each meeting during this project’s process SUPPORTED THIS PROJECT!!! That same majority will VOTE YES on MEASURE B and uphold what the City Council already approved. This union has done every dirty trick in the book to control this outcome and gain more power via their members paying dues. They will not succeed. Let’s get something straight: the City Council put the Art’s Club on March’s ballot because Unite Here Local 11 collected sufficient signatures to force the issue. I have a problem with an author who does not identify him/herself who may very well be on the payroll of the developer. The author simply repeats a lot of the half truths that echo the developer’s door to door lobbyists who never told the nearby residents this project was four times the size allowed under the General Plan and that it included a night club on the first floor. Unfortunately this project undermined an open process by flooding the debate with self serving “fake news” and will be a model for future developers. All developers have to do is spend a couple of hundred thousand dollars spreading self serving “facts” door to door to get huge density bonuses. As John Heilman said when he voted against the project, it repudiates the Sunset Specific Plan and it clearly sends a message that our General Plan has no meaning if you have plenty of cash and a clever lobbyists. It shouldn’t even be on the ballot. There needs to be on process for all buildings, as it doesn’t make sense that some buildings are now being voted on by the whole community and some go through the planning commission and city council. This building is no different than many other large buildings on Sunset that have been approved to be built or under construction that never got voted by the residents of Weho. While I am completely in support of the project as designed and already approved, and believe there are bigger issues with this silly referendum that erode the effectiveness of representative democracy, I’m disappointed that WEHOville has chosen to publish this anonymous opinion piece. The free exchange of ideas relies on ownership of those ideas. Anonymity has no place in legitimate public discourse. I have no issue with anonymity. I run a very successful twitter page this way with wonderful people sharing ideas without the obsession of politics. Just the facts, opinions, etc. You can still dispute anything, using your name or not. Learn how the Internet works. I make a distinction between the cesspool of social media, and the profession of journalism. There is a healthy debate going on in big media companies about the intersection between social media and journalism. I am well aware of how the internet works. Journalism predated the advent of digital delivery by centuries. Alan, yes. And Melisa30, could you be more condescending? I think anonymity in the comments section is OK. But not from editorial pieces in this publication. This is an article. Not a facebook post, or a tweet. It will be spread far and wide, and it would be helpful for those of us reading it to know who it is coming from.